“The Ragin’ Cajun” Carville is America’s best-known political consultant. His long list of electoral successes evidences a knack for steering overlooked campaigns to unexpected landslide victories and for re-making political underdogs into upset winners. His winning streak began in 1986, when he managed the gubernatorial victory of Robert Casey in Pennsylvania. In 1987, Carville helped guide Wallace Wilkinson to the governor’s seat in Kentucky. Carville continued his winning streak with wins in New Jersey with Frank Lautenberg elected to the US Senate. He next managed the successful 1990 gubernatorial campaign of Georgia’s Lieutenant Governor Zell Miller, including a tough primary win over Atlanta mayor Andrew Young, and in 1991, Carville — who had already become prominent in political circles — drew national attention when he led Senator Harris Wofford from 40 points behind in the polls to an upset landslide victory over former Pennsylvania Governor and U.S. Attorney General Richard Thornburgh. But his most prominent victory was in 1992 when he helped William Jefferson Clinton win the Presidency. In recent years, Carville has not been a paid political consultant for any domestic politicians or candidates for office, instead focusing on campaigns in more than 20 countries around the globe, including leading Ehud Barak to victory in his campaign to become the Prime Minister of Israel in 1999. It’s the Middle Class, Stupid! (2012), co-authored with Stan Greenberg. 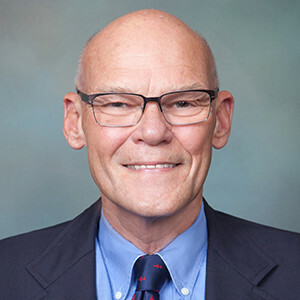 Carville can be seen on news networks worldwide. He is a columnist for The Hill newspaper which publishes daily when Congress is in session and serves as a Professor of Practice at Tulane University in New Orleans, where he lives with his wife Mary Matalin and their two daughters.